As promised, here's yet another recipe incorporating booze. :) Of course, since most of the alcohol content evaporates during the cooking process, the tequila in this recipe is really more of a flavoring agent than anything else. Directions: Place chicken on an even, non-porous surface, cut on the bias into 1" x 3” thick strips, and transfer to a re-sealable plastic bag. Next, add remaining marinade ingredients to the bag, seal, and refrigerate overnight or for at least 6-8 hours. Sauté onions in extra virgin olive oil on medium heat in a large sauté pan until translucent, about 3 minutes. Then add green and red bell peppers and cook for about 3 more minutes, or until onions turn golden brown & the peppers become tender. Deglaze with remaining 1/4 c. tequila and cook for another 3-4 minutes or so, until liquid reduces to a thin layer on the bottom of the pan. Remove from heat, transfer to a medium-sized bowl, and set aside. Heat pan. Sauté chicken in the residual olive oil and marinade juices for about 3 minutes per side, or until tender and the meat is no longer pink on the inside. (Chicken will cook very quickly, as the pan should be very hot at this point. So make sure you watch the chicken very carefully!) Transfer to a separate bowl and set aside. Next, assemble fajitas: Divide the chicken into equal portions. Place a small amount of chicken onto each tortilla, then add onions and peppers, and any toppings you’d like -- pico de gallo, shredded cheese, a dollop of nonfat Greek yoghurt, avocado slices (or guacamole), fresh cilantro, etc. Serve and enjoy! Serving Suggestions: This dish is sometimes served with refried beans and Mexican rice, although I've found the fajitas by themselves to be more than enough food for a single meal. 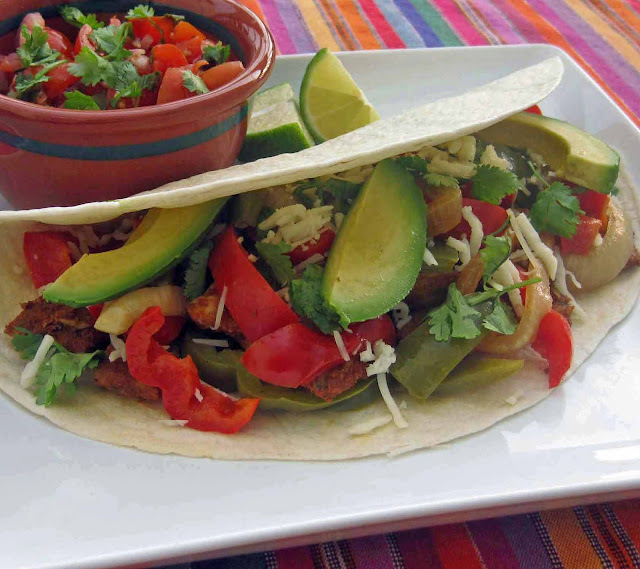 Variation: Of course, you can also make these fajitas on the grill. If you'll be doing this, I'd recommend using a slotted aluminium or metal pan so that some of the smaller/thinner ingredients don't fall into the grill grate. :) You'll probably also want to brush the slotted pan with a little bit of olive oil to prevent the ingredients from sticking. Grill the vegetables and chicken on both sides for a few minutes per side, until just cooked through. Remove from the grill and transfer to a plate. Before the chicken has a chance to cool, top chicken with cheese, so that it melts.